Aloha! Welcome back to our weekly blog! This article will be a little bit lengthier than normal. That is because this week, as mentioned in the previous update; we will be focusing on all of the unique aspects of our weekly produce harvest! Before jumping into the harvest, I’d like to brush over the rest of the weeks happenings as they are quite exciting and ever changing! 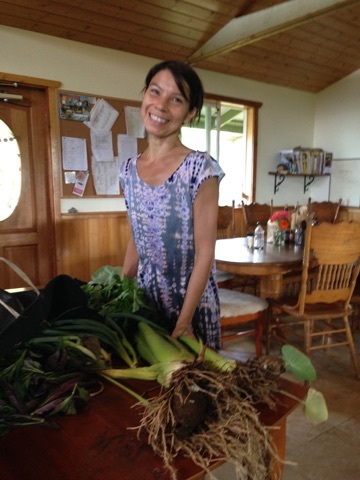 To start off our week, we welcomed in a new chef and farmily member, Tonita! She is from the San Diego area originally but has come to us from Sedona. She has quickly become a member of the team. She’s impossible not to like with her upbeat, and lighthearted attitude, coupled with a bursting enthusiasm for all the new experiences. She cooks delicious meals twice daily; taking on the challenge of all the unknown, unique, and abundant ingredients she’s surrounded by. This is where half (if not most) of our produce goes. Straight to the kitchen! As there must be a balance in all things, we are also saying goodbye to one of our farmily members this week. On behalf of the community, Johno; you’ve been an inspiration to us all, a light on each of our paths. Thank you for your ever-positive, encouraging attitude, and your dedication to the team while you stayed with us. We wish you nothing but all the best in your journey going forward and are excited to know that your knowledge obtained here will be shared and spread to the benefit of all you come into contact with. I’ll take this opportunity to springboard into the first of today’s weekly projects. On Monday and Tuesday while suffering the effects of the numerous tropical storms passing by the islands, we were huddled inside being incredibly efficient and productive working together in a tight space. Our Quonset as seen in last weeks update, has been piled to the ceiling with bamboo. 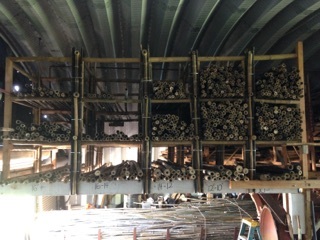 We’ve completed our shelving, and loaded all of our black bamboo into its new home! In addition to the shelves, we also had Johno create a new sign for our driveway! 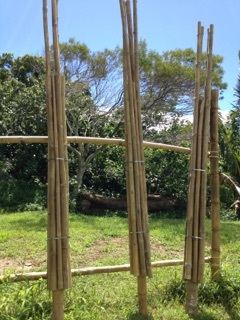 Arguably the most exciting farm news of the week; We’ve begun the construction process of our new bamboo structure! In the coming months you will be updated on this frequently, as it is a rather large project. 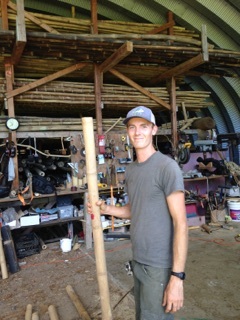 Here is a picture of the Columns we have put together so far. These follow the same “Column” design explained in last weeks update of the shelving constructed in the Quonset. To give a frame of reference, we need to assemble a total of fifty columns! This number doesn’t include anything but the structures main supports! Talk about a big undertaking. We are all incredibly stoked. Once again on Wednesday we were in the garden. Without our fearless leader Virginia to guide us, we collectively came up with different ideas of food producing projects we felt were important. We then decided which projects should have priority as a group, and got to work! Here are some photos of the day’s work. 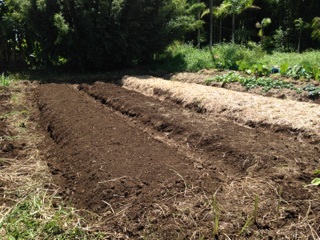 It includes two new garden beds, as well as an uncovering of mature overgrown beds! Now to focus on the highlight of today’s update. Produce Harvest! We are blessed to live and work on a land with such mature orchards, and dense, healthy plantings. 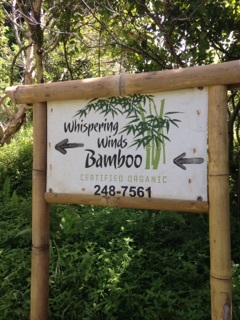 Our primary focus is to be a Biodynamic Bamboo farm with a secondary goal of the reforestation of East Maui. While this is the case, we also strive for (and achieve) a self sustainable lifestyle through the food systems in place here on the property. There are select grains and other things we do buy for our kitchen. The beginning of our produce day starts at 8am sharp, with everyone gathered to hash out who will be taking on what responsibility for the day. After considering what produce is being sold according to the weeks order (A list provided to the crew by Jade who is our resident saleswoman and office spacer,) each team breaks off in individual tasks. Following the system developed over the past few weeks, we have split into what I can roughly describe to be an orchard team, a garden team, and a mountain team. 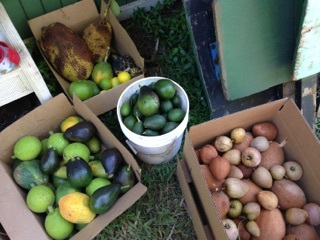 Today’s orchard team dug in right away with harvesting Avocados, three varieties of Sapote (White, Chico, and Mamae,) Lemons, Limes, Mangoes, Ulu, Noni, Papaya, Rellenia, and Lilikoi. 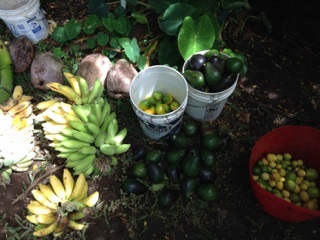 These being only a small number of the copious fruits we have growing. In other words, what is currently in season or “going off.” While harvesting we also maintain the orchards; Trimming trees and weeding as necessary. 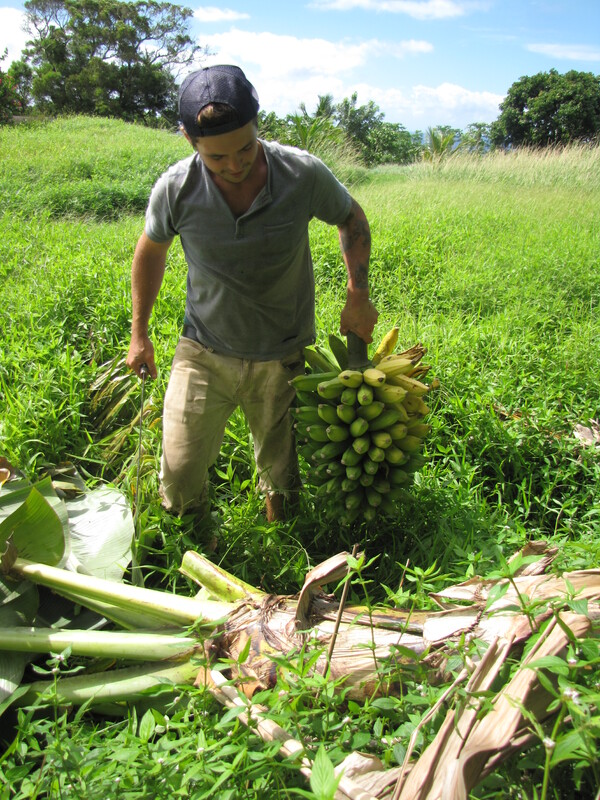 The garden team is tasked mainly with harvesting Burdock root, Ginger, Turmeric, and Sweet Potatoes. Unfortunately I was not able to get a picture during this process. Here’s a replacement photo that I’m sure will delight you just as much! This is for the farmily members who like to get down and dirty, and aren’t afraid of a lot of hole diggin’. The gardens are also monitored and maintained during this time. 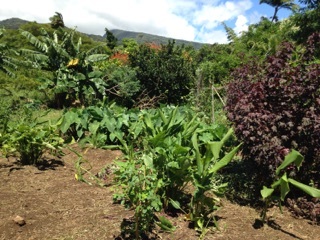 Such as navigating the squash and pumpkin vines away from our Taro, mulching any uncovered soil on the garden beds, etc. 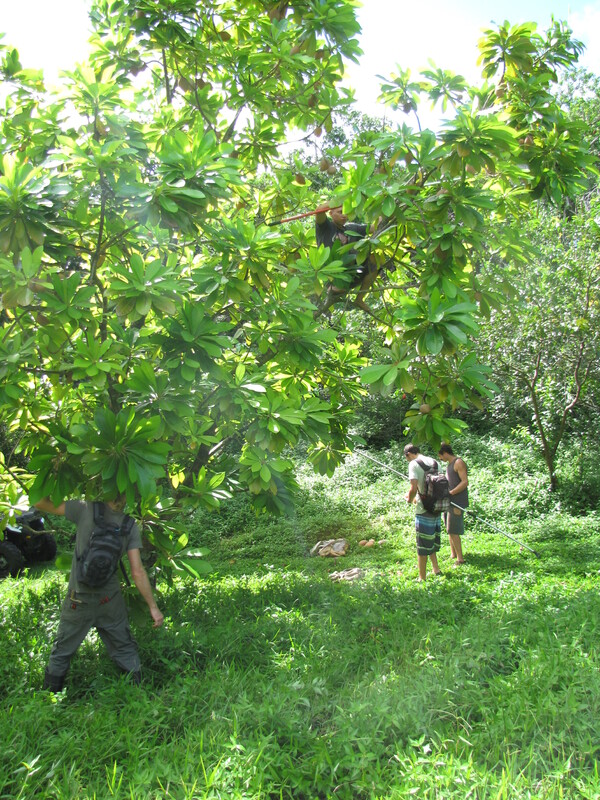 The people assigned to head up the mountain are mainly in search of ripe Jackfruit, and racks of bananas. This group also searches for Ice Cream Beans, and Ulu. 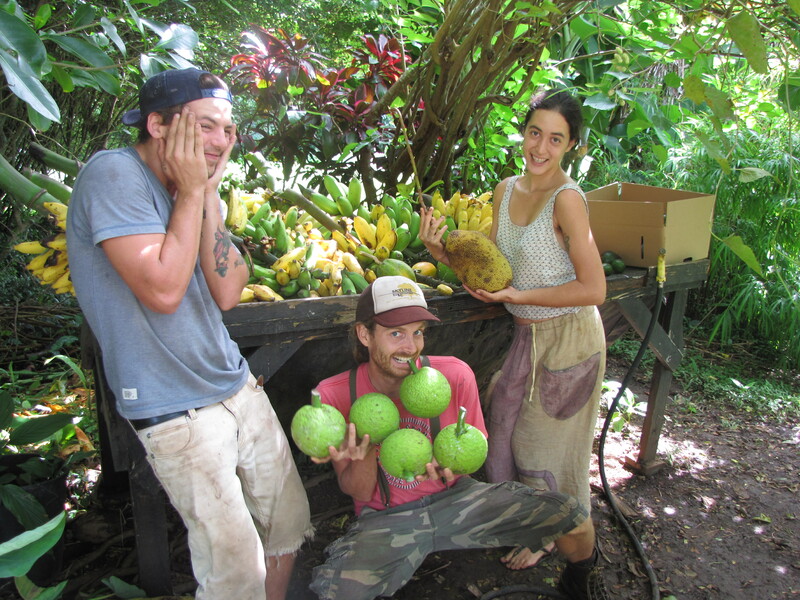 We also have a few exotic trees up the mountain, such as Rellenia shown below on the left with Gabe. As well as checking in on any variety of trees around the property for flowering (signs of a beginning fruit cycle.) 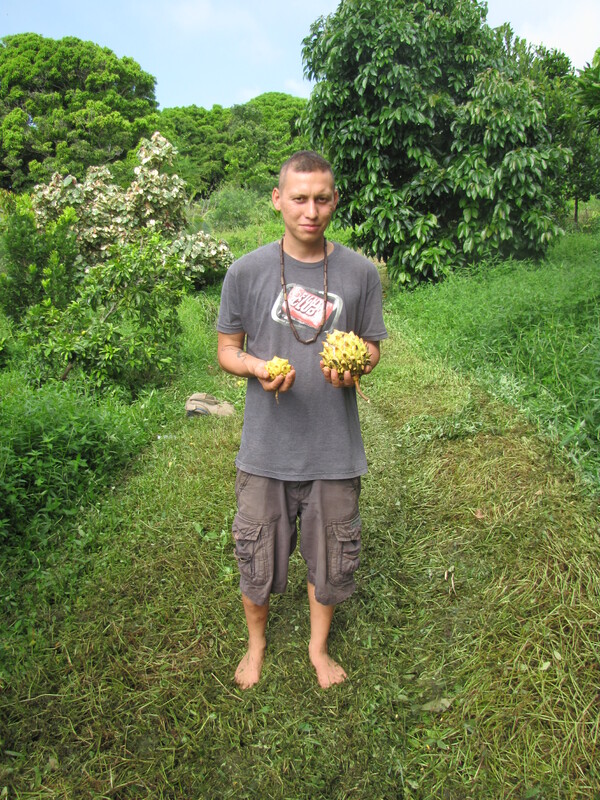 The most recent example being Ohia Ai, or “Mountain Apple.” We are also watching the growing Start fruit on the trees, as well as newly grown Cacao pods. After each team has concluded their individual tasks they meet at our harvesting table. This is where we have someone preparing all of the fruit brought in by our crew and putting it together in orders to be delivered the following day. 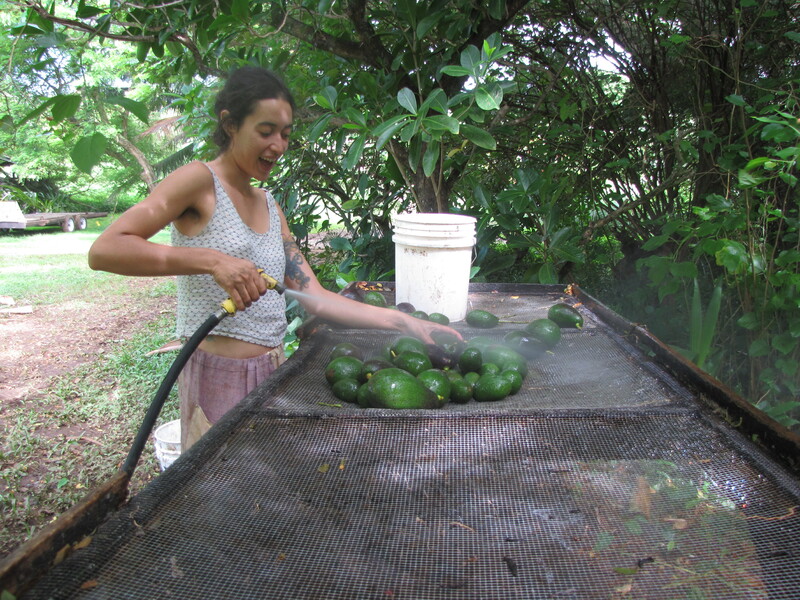 We then assimilate and tackle any remaining demands of the day’s produce harvest. This being missed harvesting opportunities, any remaining orders needing filled, or to harvest an excess amount to then stock our kitchen with. We have a huge amount of fun coming together each week to take on this task. 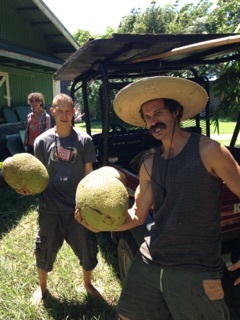 Here is photo of us just having a darn good time with Jackfruit. A huge thank you goes out to you the reader, for supporting us in this venture; taking care of the land and living self-sustainably. 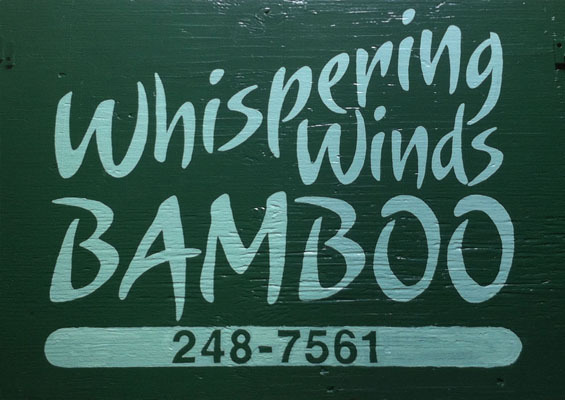 We will continue to bring you weekly updates on all things bamboo and farm related. Of course as always, we welcome your feedback and your “shares.” The crew here at Whispering Winds wishes you a wonderful week’s end!